Yr Ods have written one of the best Welsh Language pop songs of all time ‘Cofio Chdi o’r Ysgol’. It’s tempting to look at Lynch and Pritchard as a modern day Welsh version of Lennon and McCartney. As I listened to the set, every song was a ‘tune’. These guys certainly understand how to write pop songs. 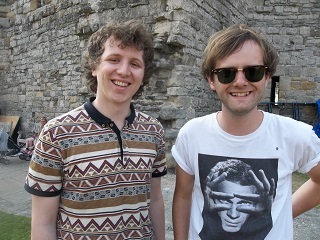 We are sitting in Caernarfon Castle on a sunny evening, everybody is in picnic and wine mode, it’s really quite pleasant and the tunes are Summer all over, feel-good, tingly, teenage, soundtracks for young kids to fall in love to for the first time or even better maybe for that first breakup – ‘Cofio chdi o’r ysgol’ could then be that Simon Bates ‘My Song’ or was it ‘My Tune’ you know the one I mean, it used to be on Radio One in the morning the big sob story and sob tune – brilliant ! The other standout song in the set ‘Y Bel yn Rowlio’ is another gem, a really great pop classic. I’m reminded of a nice version of The La’s or Cast, these are nice Welsh boys so they lack the Scouse swagger and cheekiness, but they do have the tunes. For a gig in a castle the sound quality is remarkably good but the sound guys lack a real knowledge of Yr Ods’s songs and as a consequence the synths are mixed slightly low and we certainly miss the little synth hooks that really propel Cofio and Y Bel into truly epic pop songs. I’m reminded of Pulp in a way – you need that big orchestral feel to the songs. Minor criticism. The boys naturally focus on the new album but they need to understand the rules of pop – rattle off those hits and get the crowd on your side and then gently introduce new stuff. Griff Lynch is “the skinny kid” frontman, he is the spitting image of Huw Pooh Sticks, he could have been in Television, the great 70’s New York band with Tom Verlaine. Lynch has black skinny jeans, white T shirt and very cool shades and great messy hair. It’s very very New York and he really does look like a rock’n roll star. Lynch, as some of you may know, is also a very cool and very talented TV presenter. Like his fellow Welsh Language presenter Lisa Gwilym, he is informed and intelligent and understands popular culture and Pop History. I often wonder if the powers that be in Welsh Media actually realise the talent these guys have, Gwilym’s hours on Radio Cymru were actually reduced recently just when she should have been given a primetime slot – you know, just to get things a bit more 21st century at the BBC. 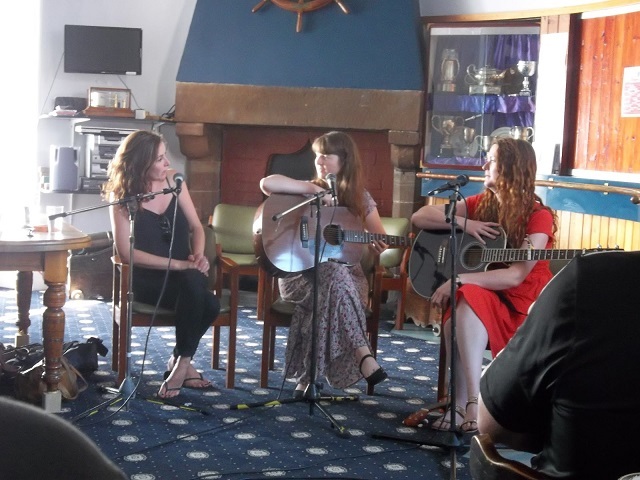 Incidentally Lisa Gwilym’s sessions with Gwyneth Glyn, Lleuwen Steffan, Manon Steffan Ross and Meinir Gwilym at the Yacht Club in Caernarfon a day earlier as part of the same Festival (Gwyl Arall – Another Festival) were truly enjoyable interviews accompanied with songs which absolutely highlighted Gwilym’s ability to steer awkward musicians into revealing the truths behind the songs and the songwriting process – again piece of piss for S4C late night TV (that imaginary Digital platform) if only anyone from S4C actually checked things like this out ???? So Lynch has great legs that suit black skinny jeans, great hair and great cheekbones (essential), like Lisa Gwilym, they both have what I’d call “effortless cool” but it’s the rock’n roll look that they both carry off without having to even try that really makes them style icons. It’s hard in the Welsh Language world because we don’t recognise style that well. If we had a Welsh Language Gay Mag then Lynch would be the cover star, T-shirt on not off, keep the white T-shirt on for sure, but Lynch could be a fashion model in the same way as the guys from The Strokes. Pop and fashion have to be interlinked which brings me to the next point and slight criticism. His band mates are solid musicians, bass and drums pump it out, the keyboard player who we don’t really hear enough of also has cool hair but I think these guys need to be vibed up, the look like they wear clothes their mum bought for them – they need to rise up a bit. They have brilliant, brilliant tunes but lack the swagger to convey what Iggy Pop once said on TV – “this is better than you realise”. To be honest they’re lads and that’s fine and they are far from being un-cool, but if you go on stage you need to dress up and throw some poses – maybe they should watch some Cyrff or Big Leaves clips on youtube just to see how they could polish up the act. Most of the crowd seemed to agree that they should have been the main support to Jarman rather than given the 7-15pm slot, they would have got the crowd ready for Jarman for sure. Geraint Jarman (main pic) is presented to the stage by C2 presenters Gethin Ev and ‘Ger’ (his cyfaill gwirion). 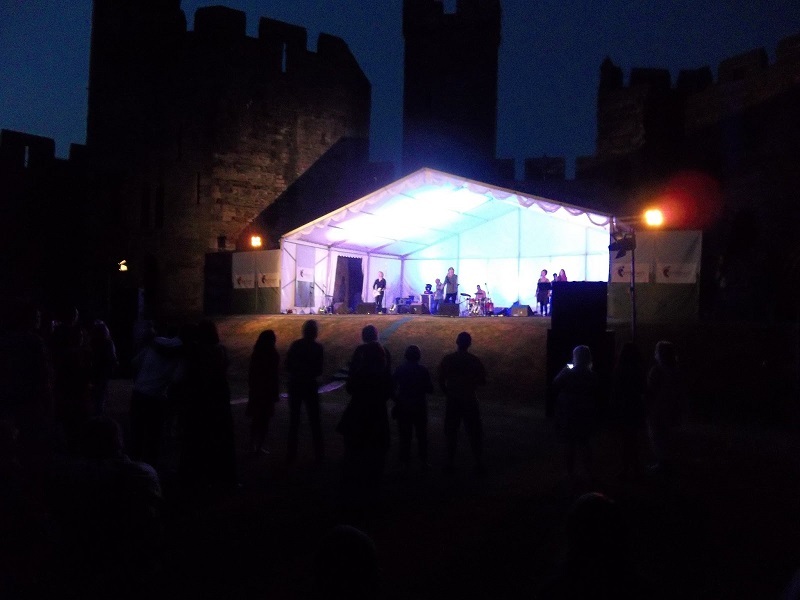 They make the only vaguely political statement of the night when they remind the crowd of the last time Jarman played at Caernarfon Castle as part of (allegedly) ‘Gwyl y Cestyll’ which resulted in Jarman being banned by Cymdeithas yr Iaith for a year. It was an incident which truly hurt Jarman if you read his book. If I had been his manager at the time I would have taken Cymdeithas head on and organised our own tours – what a great Situationist opportunity that would have been. I was never involved with Jarman. He got hurt. No one did anything. Cymdeithas became less inward looking over the years. I also wondered if Jarman got the irony – he must have done ….. back in the Castle, all is forgiven ….. However ‘Ger’ takes a swipe at Cymdeithas from the stage which really does not go down well, it’s car crash radio (which is what they do intentionally) but the crowd don’t actually do anything about it, no heckling and as Geth and Ger come of stage no one tackles them. We are in a very non-political Welsh Language scene – no debate – nothing – back to the wine. I have always voiced my criticisms of Cymdeithas but you can’t stand on stage and do the “What did the Romans ever do for us ?” routine with them – that is simply not an argument or question. Jarman starts with Bourgeois Roc a great thumping riff, he looks thin, still has hair, still wears the shades, still that iconic Jarman look, maybe it’s good that we are 50feet away from the stage, I don’t know but he looks in fine form. Peredur ap Gwynedd does the guitar job well (and strikes some great poses), Pete Hurley the bass player is solid but maybe synth boy and backing vocals could have vibed it up a bit ? To be fair this show compares favourably with most reunion shows. It sounds good. It could have done with Neil White on rhythm guitar but if you just looked at Jarman and Peredur this was a perfectly good show and no criticism really of the sound quality. Again Jarman should have gone for the killer hits, some of the more obscure reggae tracks do nothing really but get the crowd swaying, he needed them jumping. ‘Rocers’ of course was brilliant but it was a huge disappointment not to get ‘Ethiopia Newydd’. I had tweeted earlier in the day that I would ask for my money back if Ethiopia was not in the set. He finishes too soon with ‘Gwesty Cymru’ , the crowd want more but this is an 11pm curfew gig and fair play to the organisers they stick to their guns. If you don’t, you run the risk of no more gigs next year. I’d hung out all evening with Gwyn and Sion Maffia (from Maffia Mr Huws and both have done a stint with Anhrefn). They have always been huge Jarman fans. Also with us was ‘The First Lady of Welsh Folk’, Sian James, looking radiant and full of enthusiasm for new projects. I once reviewed Sian as having more talent in her little finger than most bands have with four members. 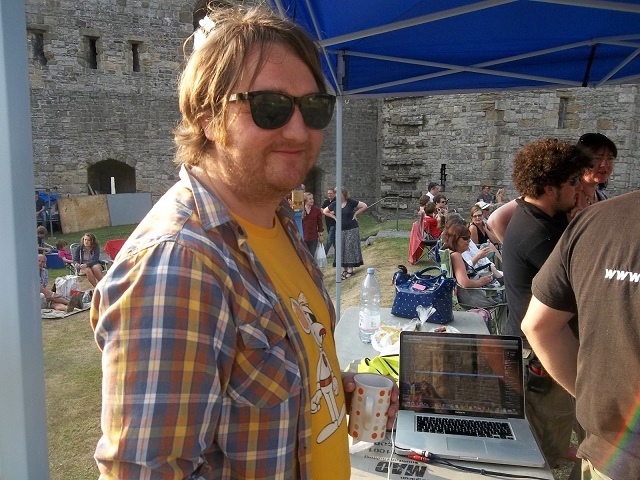 Final final mention goes to Gwyl Arall – quite simply Diolch yn Fawr – what a great little gig !